• Highest porosity and largest useable surface area, per unit weight or volume, of all filtration media available anywhere! • Provides huge amounts of anaerobic surface area for efficient bacterial colonization for denitrification, along with sulfur doping to act as an electron donor to accelerate the process in freshwater, pond or marine applications. • Provides over 71,000 square feet (6,596 square meters) of surface area per liter ofmedium. One brick has about 100,000 square feet of useable surface area for bacterial colonization. • Also reduces phosphate significantly and dissolved organics. 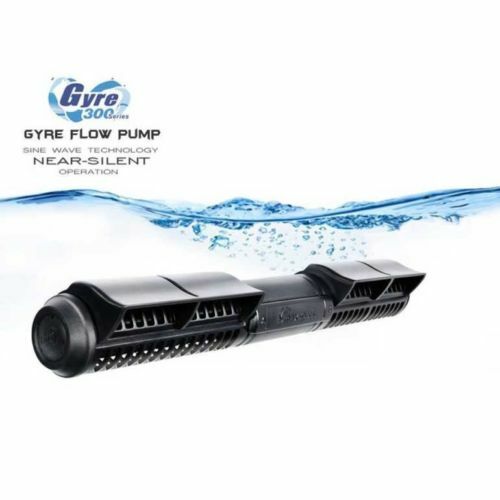 • So porous that it wicks water and stays wet for days when drained, allowing bacteria to remain viable after an equipment failure and ready for the repair. • Doped with Aragonite to buffer pH at bacteria level, preventing acid buildup which eventually would kill the bacteria and reduce capacity (which is what happens in competing products). 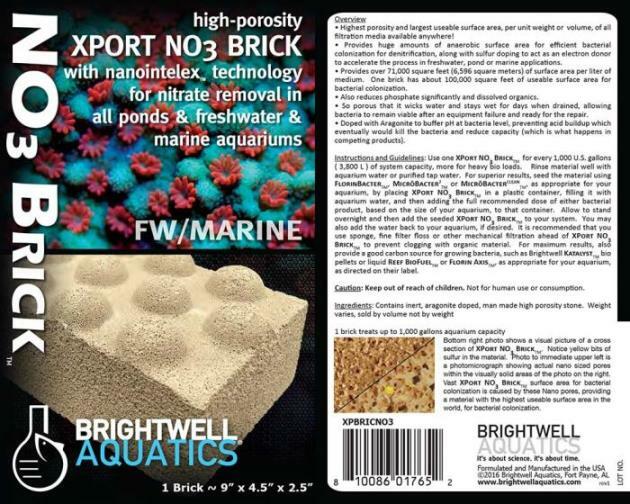 Instructions and Guidelines: Use one XPORT NO3 Brick for every 1000 gallons( 3,800 L ) of system capacity, more for heavy bio loads. Rinse material well with aquarium water or purified tap water. For superior results, seed the material using microbacter7, as appropriate for you aquarium, by placing XPORT NO3 Brick in a plastic container, filling it with aquarium water, and then adding the full recommended dose of either bacterial product, based on the size of your aquarium, to that container. Allow to stand overnight and then add the seeded XPORT NO3 Brick to your system. You may also add the water back to your aquarium, if desired. It is recommended that you use sponge, fine filter floss or other mechanical filtration ahead of XPORT NO3 Brick to prevent clogging with organic material. For maximum results, also provide a good carbon source for growing bacteria, such as Brightwell Katalyst, bio pellets or liquid Reef BioFuel, or Florin Axis, as appropriate for your aquarium, as directed on their label.